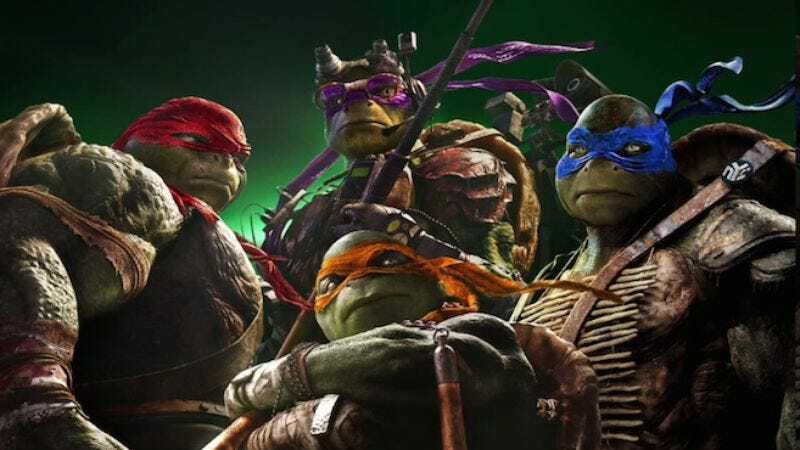 In addition to having characters you could arguably call approximations of turtles, the Michael Bay-produced Teenage Mutant Ninja Turtles fulfills the other Ninja Turtles movie requirement by having a rap song that is approximately about turtles. The Ninja Turtles’ mythology shares plenty of common signifiers with the hip-hop world, after all: adopted names; an idiomatic slang; an origin story rooted in “coming up from the streets;” an obsession with kung fu; a persecution complex; a shrewd awareness of branding opportunities. And so nearly every Turtles film must naturally have its own rap song, whether it’s Partners In Kryme’s “Turtle Power” from the 1990 movie, Vanilla Ice’s “Ninja Rap” from Secret Of The Ooze, or today, “Shell Shocked,” from Juicy J, Wiz Khalifa and Ty Dolla $ign, from the movie due August 8 that now has the street cred so crucial to the Ninja Turtles name. And “Shell Shocked” doesn’t have the all-inclusive joie de vivre of “Ninja Rap,” whose inquiry as to whether you’ve ever seen a turtle get down, slammin’ and jammin’ to the New Swing sound, make it more universal, and therefore timeless. You don’t even have to know it’s a song about Teenage Mutant Ninja Turtles to enjoy it—at the club, at your wedding, at your meeting with your divorce lawyer, as your casket is being lowered into the ground. On life’s dance floor, we’re all turtles. Tonight, we are all ninjas. Instead, “Shell Shocked” lands somewhere between the two, with its vague sentiments about brotherhood, fighting together, and being really, really rich—just like the Ninja Turtles—colored by more direct allusions to pizza (“Give me the whole pie, real cheesy”) and “bandanas on my face, like a gangster.” Of the three, Juicy J goes the most literal with his references, promising to have your back “like a turtle shell,” saying all his brothers “tryna get some cheddar / We all want our cut like the Shredder,” and calling his orange Lamborghini “with the nunchucks doors” and the green money in his pockets, respectively, “Michelangelo” and “turtle power.” But such poetic license aside, the song’s message is as clear as its predecessors: There’s a new Ninja Turtles movie, and so some new rappers were paid to make something that sort of sounds like it’s about Ninja Turtles. A full video is expected next week, in which randomly inserted scenes from the movie will make that relationship even clearer.